April 16: Zimri Carter is born in South Carolina to Thomas and Eleanor Carter. November 22: The U.S Federal Census enumerated in Laurens, Laurens County, SC showed 12-year-old Zimri living with his parents and siblings. His father, Thomas, was a farmer and owned 9 slaves. June 22: The U.S. Federal Census enumerated in Tumbling Shoals, Laurens County, SC showed 22-year-old Zimri living with his parents and siblings. His father Thomas was a farmer and owned 10 slaves. 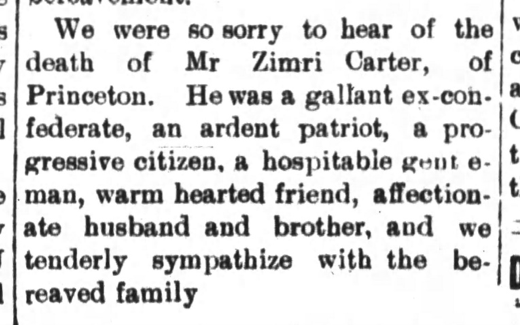 November 27: Zimri Carter enlisted in the C.S. Army. He mustered into the 16th SC Infantry. January to June: Company Muster Rolls. Present. July & August: Company Muster roll. Absent. December 17: Captured in Franklin, Tennessee. Jan 5: Zimri was received in Louisville, Kentucky from Nashville. From there he was forwarded onto Camp Chase in Ohio. He ultimately ended up at Point Lookout, Maryland. August 11: The U.S. Federal Census enumerated in Laurens, Laurens County, SC showed Zimri, a farmer, and Adeline living with their two young children. June 9: The U.S. Federal Census enumerated in Sullivan, Laurens County, SC showed Zimri, a farmer, and Addie living with their 4 young children: Ella, Suda, Tommy and Telulah. May 4: The Laurens Advertiser, Laurens, SC. June 15: The U.S. Federal Census enumerated in Sullivan, Laurens County, SC showed Zimri, a farmer, and Addie living with two of their adult children: Lillie and Maggie. June 18: Zimri Carter died. He was buried at the Carter Family Cemetery in Laurens County, SC. June 21: The Laurens Advertiser, Laurens, SC. June 22: The Evening Index, Greenwood, SC. ***Zimri was active in politics. He was a democrat.